The two candidates running for Congress in the Connecticut district with the widest economic disparity talked in a debate last week about what they’d do to close that gap. 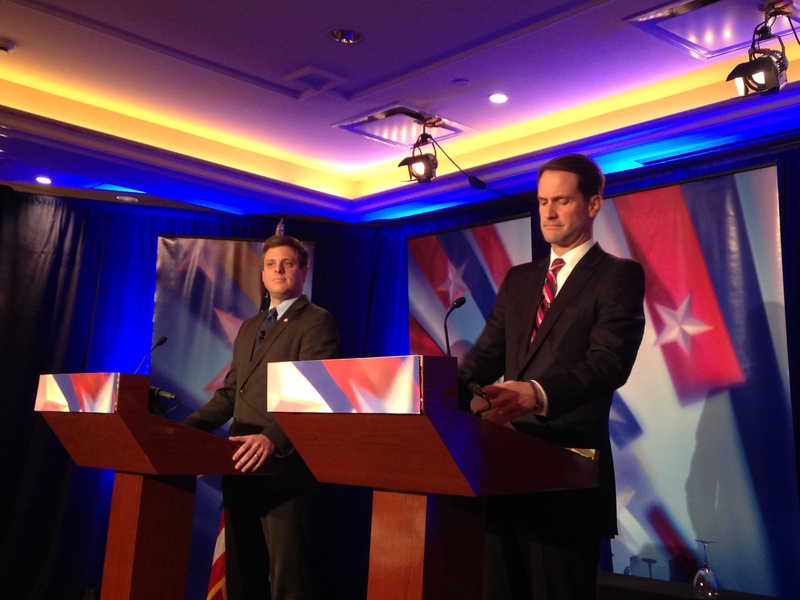 Democratic incumbent Jim Himes and Republican challenger Dan Debicella both agreed that the disparity is a problem, but they took different approaches to how they’d handle the issue. Himes said the key to addressing disparity in the region is education. Himes said he’s glad the country is having a good, if antagonistic, conversation about how to solve the education issue. Himes said he supports raising the minimum wage. And he said it’s a problem that tax benefits tend to help only people at the top of the income level. Debicella said the disparity question was very personal to him, because he grew up in Bridgeport, with a father who was a police officer and a mother who was a secretary. He said he’s the first in family to go to college. Debicella said the American Dream is threatened for too many families. Debicella is proposing what he calls enterprise zones in areas of Bridgeport, Norwalk and Stamford that are the most in need of jobs, where businesses wouldn’t be charged any federal or state taxes, and the federal government would pay local property taxes. He also said we need to reform education. He said we need to stop what he called “scare tactics” and start talking about the American dream again. A Public Interest Research Group study released this week says big-money donors make up a significant majority of funding for the most recent Congressional primaries in Connecticut. Seventy-one percent of all donor money in Connecticut came from donors who gave more than a thousand dollars. That ranked Connecticut 16th in the country for its percentage of big donations. (New York came in 5th). Evan Preston of the Connecticut Public Interest Research Group says he’s concerned about the implications of that. The study says 106 Connecticut donors gave enough to match all donations in each state of $200 or less. “If the people that can determine who can run for office are just a small subsection of the population, then that poses a real problem for which issues can be discussed in the campaign,” Preston said. WASHINGTON (AP) — Federal Reserve Chair Janet Yellen said Friday that the last several decades have seen the most sustained rise in income inequality in a century. In a speech to a Boston conference on economic opportunity, Yellen said this problem is of great concern to her and she pointed to increased education and ownership of small businesses as two ways to deal with the problem. “It is no secret that the past few decades of widening inequality can be summed up as significant income and wealth gains for those at the very top and stagnant living standards for the majority,” Yellen said in her remarks to a conference on economic opportunity sponsored by the Federal Reserve Bank of Boston. 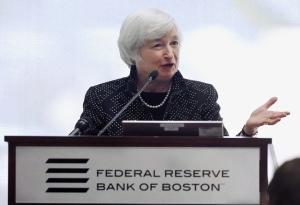 “Society faces difficult questions of how best to fairly and justly promote equal opportunity,” Yellen said. But she said she did not plan to offer solutions to these “contentious questions” but instead used her remarks to describe the landscape of inequality as it exists today. She did talk about such factors as early childhood education, affordable higher education, business ownership and inheritances as “building blocks” that could be used by Americans to boost wealth. “In focusing on these four building blocks, I do not mean to suggest that they account for all economic opportunity, but I do believe they are all significant sources opportunity for individuals and their families to improve their economic circumstances,” Yellen said. In her Boston speech, Yellen made no comments on the current state of the economy or on the future course of interest rates. The Fed next meets on Oct. 28-29 and many economists believe the recent financial market turbulence and downgrades to economic prospects around the globe increase the likelihood that the central bank will not start raising its key short-term interest rate until next summer. That rate has been at a record low near zero since December 2008. When it comes to coverage of mental health care for children in Connecticut, there’s an unusual inversion of the state’s economic disparity. Parents and health care providers say it’s easier for low-income children on the state’s Husky Medicaid plan to get certain care options covered than kids whose parents have private insurance. (We’ve talked about this on State of Disparity before). Now Connecticut is proposing a new plan to cover mental health care for kids. It involves pooling both public money and money from private insurers. And the plan is getting mixed reviews. Craig LeMoult’s story on the the plan is online here. 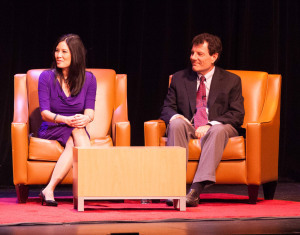 Sheryl WuDunn and Nicholas Kristof at WSHU’s “Join the Conversation” event in Fairfield on Friday. Pulitzer Prize-winning journalists Nicholas Kristof and Sheryl WuDunn’s new book “A Path Appears” looks at barriers to opportunity around the world, and what can be done to overcome them. Some of those barriers are already in place at the beginning. As WuDunn puts it, some kids are born “behind the starting line.” She says a child born in the bottom 20 percent of the economic spectrum has a one in 12.7 percent chance of making it to the top 20 percent. WuDunn and Kristof spoke at Sacred Heart University on Friday to talk about the book. WSHU’s Craig LeMoult asked them about the gap, and how it can be addressed with early intervention. WuDunn says by the age of four, a child of professionals has heard 30 million more words than the child of parents on welfare. That gap can make a significant difference in a child’s development. Kristof says the gap between wealthy and poor children is increasing. In particular, Kristof and WuDunn point to the effectiveness of the Nurse Family Partnership, which provides coaching to new parents, even before a child is born. Teaching parents not to smoke or drink, and to breastfeed and hug a baby, can have a huge impact on a child’s development. They say families who get coaching from the Nurse Family Partnership see a 79 percent drop in state-verified child abuse, and the children are half as likely to be arrested by age of 15. A program that’s working to close that 30 million word gap is Reach Out and Read, which provides books to low income families to help with the cognitive development of children. The program provides books, and doctors “prescribe” nightly bedtime stories to families. Here’s Kristof and WuDunn describing the program. The cost is $20 per child per year. But Kristof says only a third of children who would benefit from the program in the U.S. get that intervention. Kristof says unlike the U.S., economic inequality has declined globally. In particular, he says one of the great global changes has been an increase in literacy. You can hear the full audio of Kristof and WuDunn’s discussion here. There are some things that are constant, no matter where on the economic ladder people find themselves. And it can be telling to look at the differences, and the commonalities. Two stories on WSHU recently have looked at very different experiences in youth sports. First, we visited the YMCA in the wealthy town of New Canaan, Connecticut, to see middle school and high school girls compete in one of the top teams in the country in… synchronized swimming. 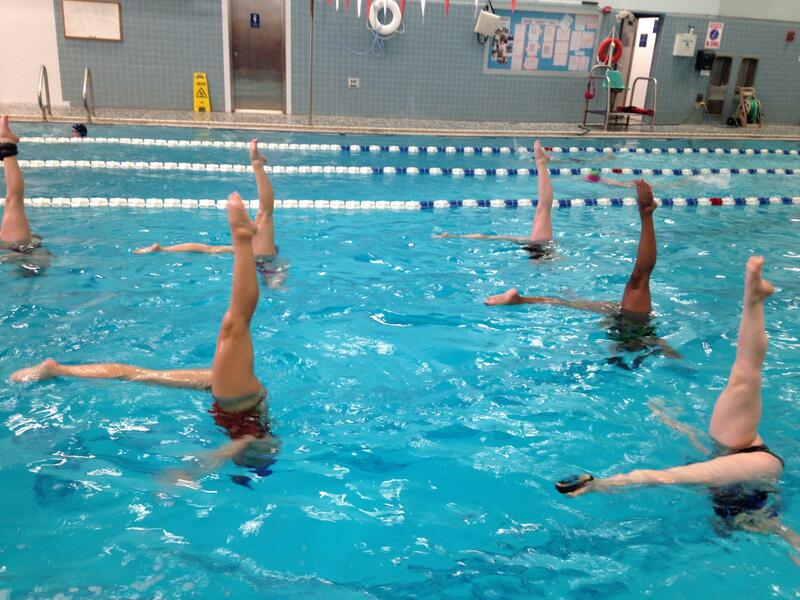 Synchro, as they call it, is certainly not your usual after school sport. And that’s part of why these girls love it so much. Here’s Craig LeMoult’s story on the team. 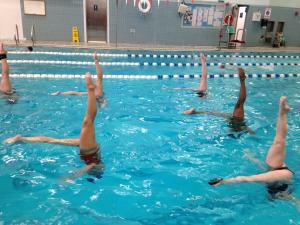 You can see video and a photo slideshow of the synchro team here. One reason you don’t see a synchronized swimming team in every town might be the expense. One coach estimated the cost could average $10,000 to $12,000 a year, including coaching fees, a lot of travel, and of course glittery bathing suits. And those bathing suits don’t just glitter themselves. Parent involvement is key – one swimmer said her mother spent hours applying that glitter. One family moved to Connecticut from Pennsylvania so that their daughter could train on the New Canaan team. You can see video and a photo slideshow of the boxers here. Canady charges $20 a month to train a kid in the gym, and she’s willing to be flexible if that’s too difficult for families. Of course, there’s a lot that’s different about the Y synchro team and the Elephant in the Room Boxing Club. First of all, there’s the background the kids are coming from. It’s the difference between providing a sport that will look good on a college application and coaching one to prevent kids from being shot. And it’s the difference between $12,000 a year and $240 a year. And sure, there are plenty of other differences. But despite all that, it’s the similarities that are the most striking. Both sports require a significant time commitment and hard physical work from the kids. All that time and work is aimed at improving an ability that’s equal parts strength and style. 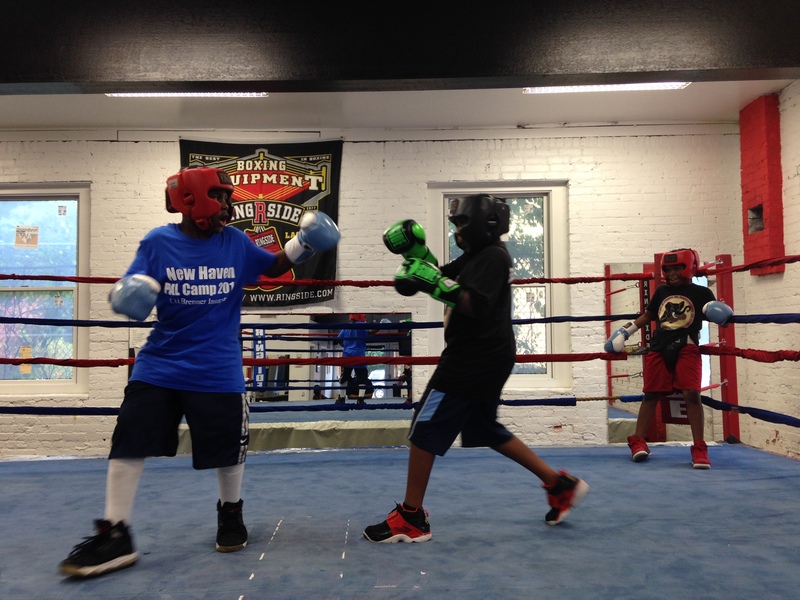 Both sports teach kids the importance of discipline and focus. Both are coached by passionate women who are driven to see the kids perform their best. 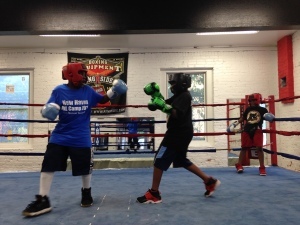 And, hopefully, both will lead to kids who grow up stronger, smarter and more ready to succeed – whether it’s in a ring, in a pool, or anywhere else. As we’ve been reporting here at State of Disparity, Connecticut continues to have one of the widest gaps in the country between its wealthy and poor residents. Craig LeMoult spoke with some of the artists. New U.S. Census data out Thursday says Connecticut continues to be among the most unequal places in the country – behind just Washington, D.C. and New York. Inequality is measured on a scale called the Gini Index. In the scale, a score of 0 would indicate a community is perfectly equal, meaning there’s a completely proportional distribution of income. A one one the Gini Index would mean a community is totally unequal – so one house would have all the income and everyone else would have nothing. According to the new American Community Survey data, the level of inequality in Connecticut may have slightly increased, with the Gini Index going from .492 in 2012 to .499 in 2013. But the increase is within the margin of error, so it’s not statistically significant. This data map from the Connecticut State Data Center compares levels of inequality around the country, and the chart at the bottom compares them to inequality around the world. A map of inequality rates from 2012 is online here. The new data show the percentage of people living in poverty in Connecticut remained steady from 2012 through last year, mirroring national statistics. 10.7 percent of Connecticut residents are living in poverty. Nationally, 48.8 million people, about 16 percent, lived in poverty last year. A family of four is considered to be living in poverty if it brings in less than $23,830 in a year. For an individual, the number is less than $11,890. In Connecticut, the median household income edged down slightly in 2013, to about $67,000 from $68,000 the year before. That’s still significantly higher than the national median amount – which was about $52,000 last year. Connecticut’s rising income disparity is causing the state’s revenue from taxes to grow more slowly and to become more volatile. That’s according to a report from the credit rating agency Standard & Poor’s. “Connecticut has the unenviable position shared by only three other states in the nation where it is in the top 10 of the most unequal in terms of income distribution, and in the top 10 most volatile in terms of revenue performance,” said Gabe Petek, a credit analyst with S&P. Petek says those two things are related. Because of Connecticut’s increasing reliance on tax revenues from people at the top of the economic spectrum, the state budget winds up fluctuating with the markets. Standard & Poor’s is looking into this issue out of an interest in states’ abilities to pay their debts. Since 2003, the S&P bond rating of Connecticut has remained at double-A, indicating a very strong capacity to meet financial commitments. “If the state budget makers agree on a budget and then revenue comes in 5 or 10 percent below what they assumed when they set the budget, they have a real crisis on their hands, and we saw that during the great recession,” said Petek. In addition to increasing volatility, Connecticut has seen the growth of its tax revenue slowing down. It hit a high of 10.8 percent in the 1980s and since 2009 has gone down to 7.3 percent. Petek says New York is among the states with the greatest inequality, but it doesn’t have as much tax volatility as Connecticut. He says that’s because New York has a broader income base with a higher share of revenue coming from wages and salaries, compared to Connecticut, which relies more heavily on capital gains taxes. S&P boosted New York’s bond rating to double-A plus in July – slightly higher than Connecticut and the highest the state has been rated since 1972. State of Disparity wants to hear from you! How does inequality affect your community? How do economic differences impact how you interact with people in your life? Please click here and share your thoughts with us. It will only take a moment, and your input will help us tell stories here on the State of Disparity blog and on WSHU. Thank you!